Join one man's persistent pursuit of the truth behind what the Bible says and doesn't say about hell in this thought-provoking family film. When he's just a child, Edward Fudge loses a friend in a car accident and wonders if the rebellious boy went to hell. The tragedy leads to a lifelong curiosity for Edward, who goes to seminary to become a preacher. There, through the help of his mentor Carl Ketcherside and an intense study of the Bible, Edward begins to challenge long-established traditions and meets his nemesis Don Haloway. However, things really heat up when Edward is hired to research the topic of hell and his conclusions ignite a fiery debate among Christians that continues today. In the title role, Astin captures the wit, humor, and humility of the famous theologian and scholar best known for his book The Fire That Consumes, which remains one of the most influential books on hell ever written. 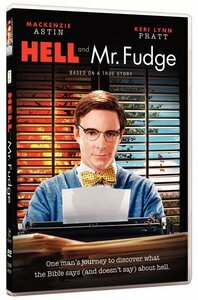 Based on a true story, Hell and Mr. Fudge is an entertaining and memorable drama about the abundant grace Christ gives for "whosoever believes in Him." About "Hell & Mr. Fudge"